Street artist Lily Goodspeed applies a marker in her site-specific, sticker-art project called Plaque 2 the Future. To be commemorated with an official Pennsylvania historical marker, a person must, among other things, be deceased. For those who would rather not wait, Lily Goodspeed, 26, of South Philadelphia, is offering a shortcut. It's meant for those moments that don't exactly rise to the level of history. For example: "Marco M. and his son Luis were walking by this tree on Carpenter Street in July 2014. Luis had just turned 3 years old, and he asked what type of tree it was. Unfortunately, Marco wasn't exactly sure. Then they both decided to hug the tree (because it felt right at the time)." An example of Lily Goodspeed’s sticker-art project called Plaque 2 the Future. It's a site-specific sticker-art project called Plaque 2 the Future — memorializing anecdotes submitted by everyday Philadelphians, formatted by Goodspeed, printed onto waterproof stickers, and posted at the scene of the incidents. "I feel like there are such amazing stories happening every day," Goodspeed said. "There are so few official plaques. I thought it would be great to have some unofficial ones, telling the types of stories that don't always get recognized." Goodspeed, a first-time street artist who spends her days working for Bok Building developer Scout Ltd., was daydreaming about what would go on her own Philadelphia history plaque when she decided instead to open it up to friends and strangers. She figured it was something she could do on her own, even if it wasn't exactly legal. Some stories they've submitted are personal: "The first one I did was from my friend Matt, who told me about this time he was trying to romance this girl when he was at Villanova, and they drove to South Philly. He parked on the median, and they sat on the roof and ate pizza, and that was something he would always think about when he went to Broad and Snyder." There are lots of romantic successes, and also failures. Bardascino Park got a plaque after three friends discovered they'd all gone there to break up with their partners. Others celebrate the quirks of life in Philadelphia. "A guy was walking at Broad and McKean and saw this guy walk toward him, pick up a pigeon, put it in his coat, and walk away," she said. "There's this kind of absurdity sometimes to living in a city, and that totally captured it." Goodspeed has posted about 20 signs over the last two months and aims to add six or seven each week. She has been receiving three submissions a day to her website, plaque2thefuture.com — more than she can keep up with. Because she sends them out for printing, the process from pitch to plaque takes about a week. Compare that to the long, slow, expensive process of installing the real deal. "First of all, it's not a plaque. It's a historical marker," said Celeste Morello, a historian who has successfully made applications for more than 40 of them over the last 25 years. She would like to see many more. "South of Washington Avenue on both sides of the river, there are only seven of them," she said. "I think it speaks for a lot of people and whether they identify with their history." Sometimes, she feels that the only thing people use the markers for is locking up their bikes. "I don't really get any support." She applied for a marker in honor of Mayor Frank Rizzo four years after his death, but the application was denied. It was too soon, she said. "I didn't give his legacy a chance to bear out." Her most recent was for Einstein Medical Center, which opened in 1866 as the Jewish Hospital and which will finally get a historical marker in a ceremony Oct. 11. The hospital's previous application had failed. Only about one-third of applications submitted each year are approved. Morello's successful application was 71 pages long. "What I found in my research," she said, "was one of the reasons they started a Jewish hospital was because there were so many poor Jews in Christian hospitals, and there were attempts to proselytize Jews on their deathbeds, to baptize them." Compared with a historical achievement of that magnitude, she thinks, Goodspeed's concept falls short. "I think it degrades the process because it's so difficult to get the official marker," she said. "Let them choose another medium." All told, there are more than 2,500 approved historical markers in Pennsylvania — 303 of them in Philadelphia — though a few hundred of those are missing. Nineteen have been approved this year. Karen Galle, the historical marker program coordinator for the Pennsylvania Historical and Museum Commission, said the applicant must come up with all of the money to pay for the marker. The cheapest version is $1,000. As for the street-art project? "We have become aware of something we forwarded to the legal department," she said, "so I'm not at liberty to make any comment about that." Commission spokesman Howard Pollman said the counsel would review whether it infringed on the panel's copyright. 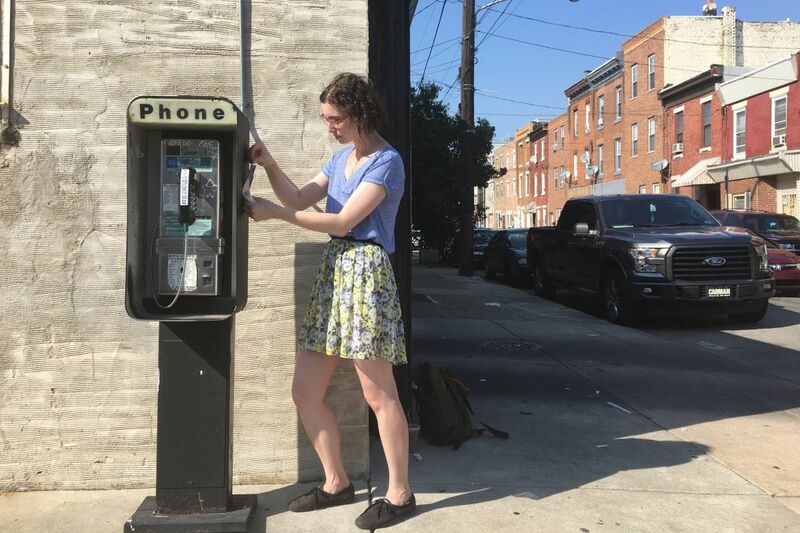 Goodspeed intends her plaques — not, after all, historical markers — as playful tributes to Philadelphia, and a way to explore and connect with a city where she has lived for just three years. So far, her approach has not been to ask permission, though defacing public property is a violation of Philadelphia code and can carry a fine of $100 to $300. Mailboxes are federal property, so vandalizing them violates federal law. Unlike the official markers, hers are temporary. "This street art is ephemeral," she said, "just like the memories." And they're not about a static history so much as a shared, lived experience that continues unspooling day by day. "People's experiences of cities are a patchwork of all these different memories, people you knew, experiences you had, trials and tribulations," she said. "The point of the project is to appreciate a city as that patchwork of different layers of time and place and people that are constantly changing."